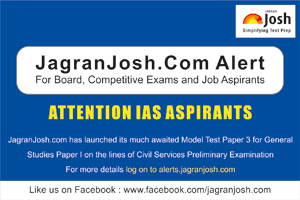 Jagranjosh.com has launched its much awaited Model Test Paper 3 for General Studies Paper I on the lines of Civil Services Preliminary Examination. In the advent of CSAT made qualifying the General studies paper I will have a more pre-eminent role. To address these concerns Jagranjosh has come up with its General Studies Model Test Paper 3 in continuation with Model Test Paper 1 and 2. This Model Test paper is based on the latest Civil Services/IAS Prelims pattern. Attempting this Model test Paper will help candidates in fine tuning their last minute preparation in accordance with the IAS Prelims Exam. Solving this test paper will infuse confidence in appearing Candidates. This is very much similar to General Studies Paper I of IAS Prelims Exam. The Model Test Paper maintains the balance across the topic. It cover Questions from Geography, Economics, History, Indian polity, Environment & Ecology, Science & Tech, Current Affairs, Budget 2015-16 and Economic Survey. The Preliminary Examination 2015 would be held on August 23, 2015. The Candidates preparing seriously for IAS Prelims Exam cannot afford to miss this Model Test Paper. It is almost a simulation of actual IAS Prelims General Studies Paper I.